Yet, the number of users with ad blockers (AdBlock, UC Browser, Adguard, KIS Anti-Banner etc.) is boosting. $21.8 bn. 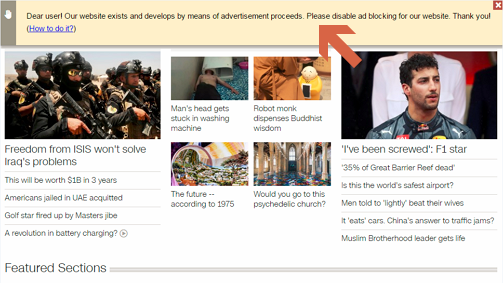 annually – that is the losses caused by ad blocking worldwide*. This figure also includes your lost revenues. What can be done? AdRegain offers a technology enabling to recover the revenues lost as a result of ad blocking, implemented in line with IAB recommendations. How does it work? AdRegain provides a js-code, which asks visitors with ad blocker to disable it for your website and thus support the project they love. Our script can detect almost all of existing ad blockers, including Adblock, Adblock plus, uBlock, UC Browser, Adguard, KIS Anti-Banner etc. Therefore, you inform the readers that advertisement is an important and even the only available source of revenue and the project will cease to exist without it. If your website has AdRegain statistics code in place, in addition you may see what percentage of visitors satisfies your request, unblocks advertisement and adds your web-site to exclusions. If your revenue from advertisement tanks to the extent threatening the existence of your project, you can deny access for the users, who block advertisement. This is an extreme measure. It is reasonable to resort to it only if your share of people using ad blockers is high and you cannot display alternative advertisement (for instance, through AdRegain Chameleon). In this case, you may want to install a script that blocks access to your website. Customize js-script according to your needs (message, when to display it etc.). If you have your website connected to AdRegain statistics, you will see how many users agree to unblock. AdRegain doesn’t recommend blocking access for visitors. You may lose some of your audience, which blocks advertisement, but can benefit website in a different way: through re-posts in social networks, by generating user content on forums etc. Using AdRegain Chameleon you can display nonintrusive advertisement avoiding adblock. 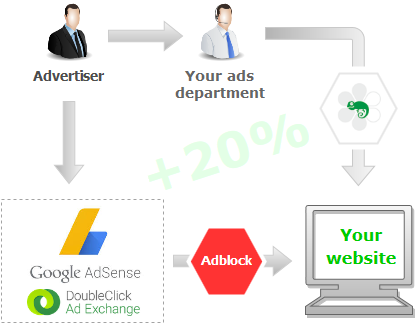 In this case, instead of blocked banners the user will see alternative banners, placed on the website under direct agreements with advertisers rather than through Adsense and Yandex networks. * According to Adobe and PageFaire 2015 research. Check words against the blacklist (easylist). This tool helps to generate html-code not conflicting with AdBlock plus.